Because this blog is our family scrapbook mainly - I want to not forget what we have been up to the last few days. Thursday we went to play group at my friend Maegan's house. She just moved to a new house and it's so pretty. She has inspired me to frame and hang a lot of pictures. I need to get to work on that! 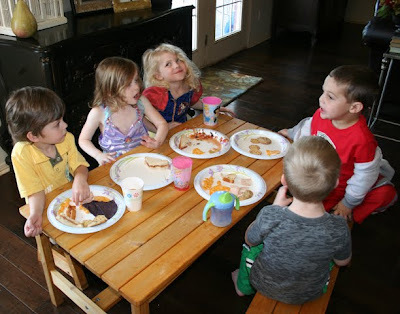 It was WAY windy outside so the kids had a picnic inside. 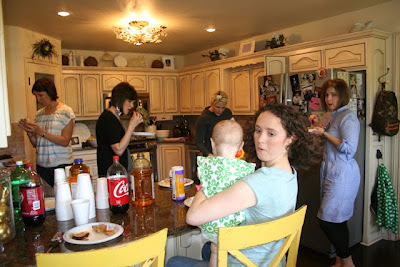 Harper was SO busy at their house that I never got a good picture of her. They have a huge basement that makes the best playroom so it was a fun place to play. 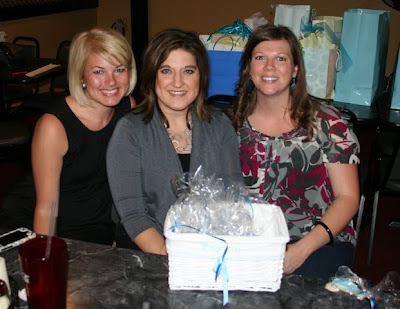 Thursday night we had a shower for my friend Jessica who is expecting her second son Peyton. This is me, Jessica's aunt-in-law Angie (who is one of my friends from choir (when I was in choir)) and Jessica. 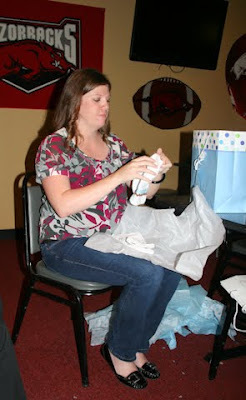 We always have just casual showers for the second babies and give mostly diapers and other necessities. It's so nice and fun. I loved it because Jessica picked to have hers at a pizza buffet! Friday was a very stormy day and we were under tornado watch most of the day. When it finally cleared I got out to run a few errands and went by Laurie's house to meet her new cat. She was supposed to be named Diamond (Emily picked it) but by the time I got there - they had re-named her Pink-a-boo. Pink-a-boo was hiding so I never got a good picture of her but it probably doesn't matter because she was returned to the original owner today. Just didn't work out. Then we went to the mall and let Harper ride some rides. We walked around the mall a little bit and then hit up Sam's. We had planned to go eat around 5 but when we finished at Sam's it was only 4 and Scott thought we should go ahead and eat. I was kind of thinking "What are we - senior citizens? 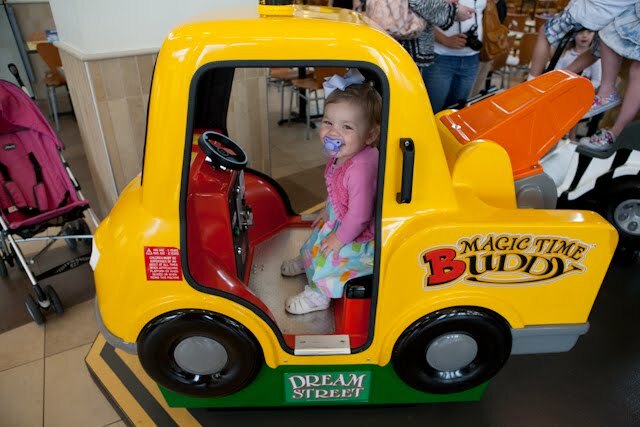 Should we just drive on to Luby's?" but we went to P F Chang and there was a waiting list. SERIOUSLY? Apparently for all of you not in the know - 4 is the "cool" time to eat these days! ha! I'm wearing a dress I have thought was red and Scott said it was orange and I just discovered it's maybe a coral color. Or maybe I'm color blind. 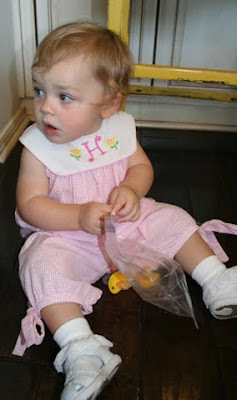 I tried to let Harper run out a little energy before she ate. Harper coloring before we ate. I'm 95% sure she is going to be a lefty. She uses her left hand for everything. I'm hoping that means she is creative. She was pretty wild at dinner and we decided we were NEVER going out to eat with her again. ha! And probably that she is going to be an only child. We decide both of these things on a weekly basis but then we go out to eat the next week and she smiles so cute and I can't help but think maybe she should have a sibling. ha ha ha ha!